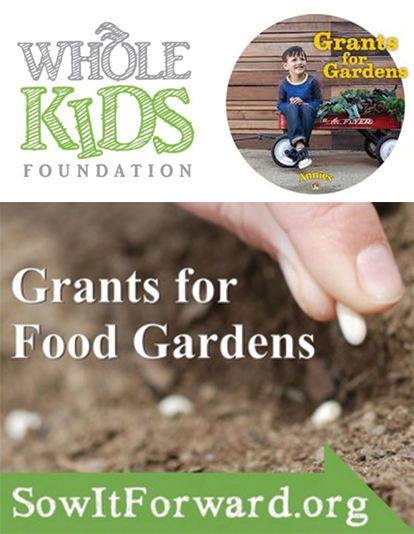 For the fourth year in a row, FoodCorps has partnered with Whole Kids Foundation to provide $2,000 grants for new or existing edible gardens run by K-12 schools or their nonprofit partners. The application is open now through October 31st. Learn more about the program here. Apply today! Annie's is a longtime supporter of gardens around the country. For many years, Annie’s has offered Grants for Gardens to schools and other educational programs that help put children in direct contact with growing real food. Annie’s Grants for Gardens awards can be used to buy gardening tools, seeds or other needed supplies. Applications period is October 1- December 15, 2014. Click here to read more and apply. Kitchen Gardeners International's Sow It Forward mini-grants program just opened its online application's doors. KGI expects to offer 100 full grants and roughly 60 partial grants. A full grant has a value of $500 and normally consists of a cash grant of $300-400 with the remaining $100-$200 taking the form of seeds and gift certificates for garden supplies and KGI's online garden planner. The partial grant normally has a value of $325 and consists of a $300 cash grant and $25 one-year subscription to KGI's online garden planner. There are no geographic limitations on what types of food garden projects will be considered. Application deadline for the 2015 grant cycle is January 9, 2015. Apply today!